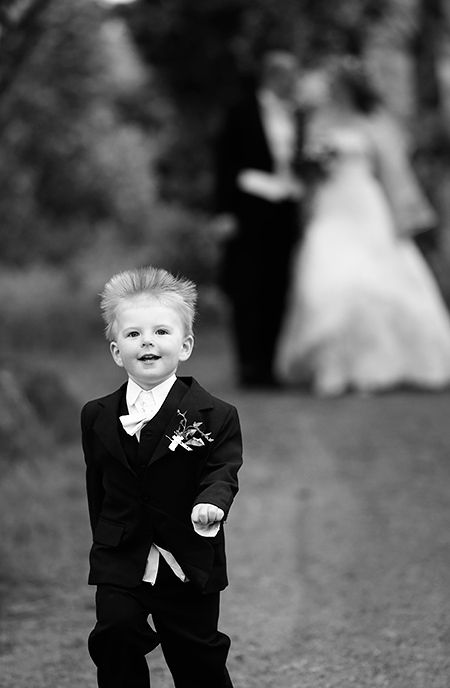 The bridal couple' s little boy, two years old, was also there in several pictures. We photographed everything, from when he was somewhat reluctantly dressed up to his mischief as soon as he got hold of something more exciting. 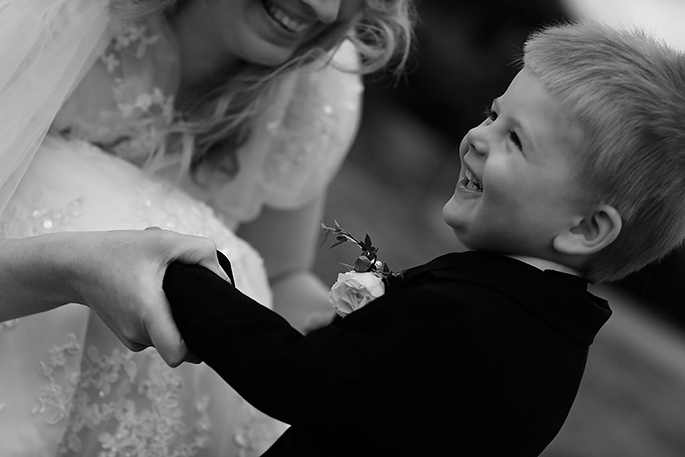 When photographing in black and white, you seldom have to crop pictures afterwards, since there are no disturbing color spots in the background. Camera equipment: EOS-1D X. 50 mm f/1,4. Exposure: f/ 1,6, 1/1600 sec., ISO 50. Aperture priority. Exp. compensation - 1 stop. Picture style: Monochrome, increased contrast. On request I publish the latest blog, with some changes and extra pics in English. It is fun snapping something else than birds. I wrote in my book Konsten att fotografera fåglar och andra djur/The Art of photographing birds and other animals/ that when it comes to action pictures of birds, it is often a good idea to leave space for cropping afterwards. When it comes to landscapes, however, you have time to compose, the landscape stays put. I also often experience the same thing when I am portraying people, even when it is about movement and a certain action. It is considerably easier to compose pictures completed in the camera of people than of flying and unpredictable birds. If on top of that I photograph in black and white (I choose monochrome picture style in the camera, then I increase the contrast and perhaps I also underexpose one or two steps to increase the depth or drama of the picture), it is easier still to get a finished composition in the camera. When I photograph in colour, however, there is not seldom a colour in the background that happens to run off and that I perhaps missed when photographing or could not get rid of. With black-and-white picture style setting in the camera I automatically avoid the disturbing colours. Exposure: f/ 2,8. 1/2000 sec. ISO 125. Aperture priority. Picture style: Monochrome, increased contrast. My wife and I photographed a wedding the other weekend. I do not generally do that, but we were asked to do that. The worst thing about a wedding is that you must not fail. For a pro that of course applies to many cases, but at a wedding it is especially important. And that is the rule even if you are asked by some friends to do the photography at their wedding. Certainly, some people do marry twice or more, but the bridal couple probably prefers to think it is a thing you only do once in your lifetime. And then you do not want the photographer to come afterwards saying sorry, no pics. I was using both black and white and colour. Most often, I had the monochrome picture style setting for the JPEGs, which meant that I got black-and-white JPEG pictures, but since I simultaneously used the RAW format I got RAW files where all colours were still there. Thus, I can go back to the RAW file and remake the picture into a colour picture. You can of course remake the colour pictures into black-and-white pictures afterwards in Photoshop, and then you have greater possibilities to change your settings. The advantage of monochrome picture setting in the camera is that the pictures I see on the LCD screen are pictures in black and white. In this way, it is easier to "think" in black and white. I also think that it is more fun to work with monochrome photos in the camera than sitting with the pictures afterwards in the computer to make them B/W. If kids are also to be photographed, you have to allow for that they do not always stand where you thought they should. But it can still be a cosy picture for the souvenir album. Here I was forced to crop the picture to get more tension. Exposure: f/ 3,2. 1/1328 sec. ISO 125. Aperture priority. 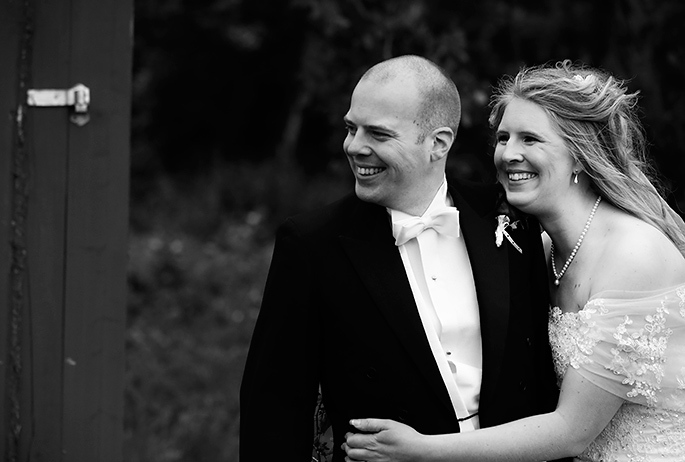 Before we photographed Sara's and Björn's wedding, I saw a fine video by the crack wedding photographer Benny Ottosson. It makes you confident to check how others do before you try something new. Then maybe you still do everything totally in your own way, but it's good to have something to relate to. 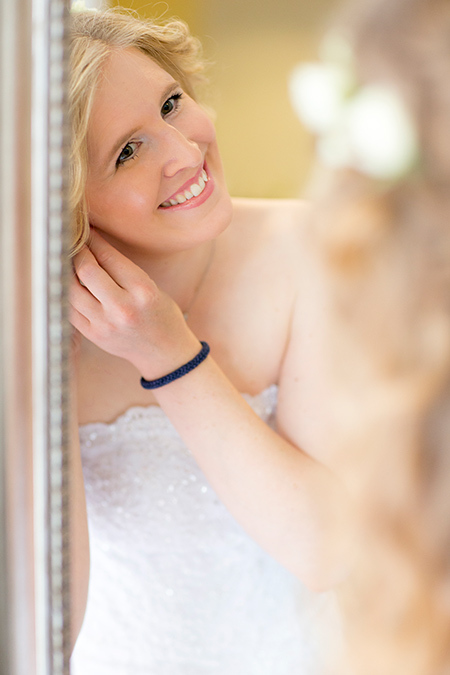 We started photographing in the morning, when the bride was to be dressed up. We met at the hairdresser's and it was an hour later than we had thought. The bride was cool and took it easy when the hair stylist did not appear until fiftyfive minutes too late and we were a little pressed for time. 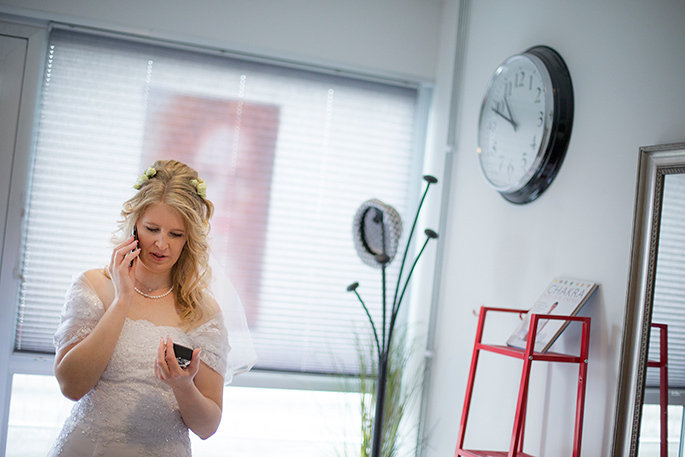 A picture where the almost completely dressed-up bride phones from the hairdresser's to tell that she will be late for the group photography was therefore necessary. "We are late for the group photography," the bride phones to tell. A good idea is to include the wall clock in the picture to additionally illustrate the situation. Exposure: f/ 1,6. 1/3200 sec. ISO 1600. Aperture priority. Exposure compensation plus approx. one stop. Sometimes the background is messy and you cannot find the proper angle. Then a short depth of field with an (almost) maximal aperture helps to focus on what is important in the picture. Exposure: f/1,6, 1/400 sec. ISO 1600. A warm tint is often preferable. Set the colour balance a little warmer than what the auto white balance would have done. If this picture is to be used somewhere , I will probably crop it, at least to the left. My wife and I photographed together most of the time. But in the early morning she helped dress the bride. To finish the pictures now afterwards, no special retouching of the pictures of the bride were needed. 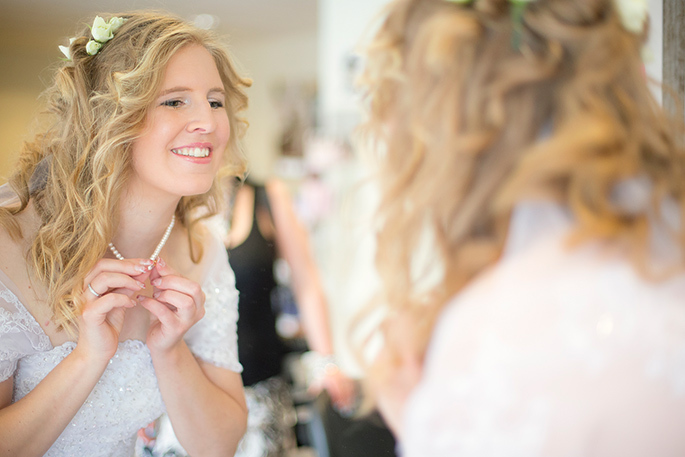 But unlike documentary photos a photographer has to depict not least the bride to her advantage, and you must definitely retouch everything that does not look good in a picture. If something does not look quite good in a picture, the photographer should do light touch-ups. Not doing it would be close to unethical when it comes to wedding, fashion or celebrity photography. The couple's two-year old son Erik helped give additional life to some of the pictures. But he was seldom standing still. It was a good thing the autofocus was set on Al-Servo, because the bridal couple was going to walk against the camera. EOS-1 DX. 70–200 mm f/2,8 L IS II USM at 200 mm. Exposure: f/ 4, 1/2000 sec. ISO 2000. Aperture priority. When everyone was sitting in the pews waiting I could sneak out unnoticed into the presbytery, since I had taken a seat strategically at the door. There I could open the side door and then "on the sly" photograph the bride arriving in the pouring rain. These photos was a surprise for her, and she laughed a lot when I showed them for the couple afterwards. She really had to keep up the gown trailer in the heavy rain. EOS-1 DX. 70–200 mm f/2,8 L IS II USM at 150 mm. Exposure: f/ 3,2, 1/500 sec. ISO 800. Aperture priority. Once there in the church, I took a seat to the right at the very back to be able to photograph the bridal couple with the bride facing me. My wife placed herself left of the altar to get another angle, facing the bridegroom. 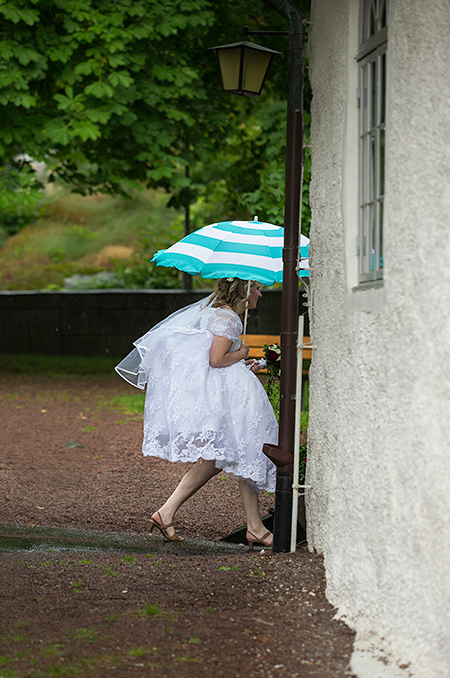 When everyone was sitting in the church waiting, I could furtively sneak out into the vestry, and through its open door I photographed the bride when she came running with her bridal gown and train under the umbrella in the pouring rain. A picture that might be fun in the memorial album and will probably be a surprise to the bridal couple. Same exposure as for the former picture. Naturally, there were also many pictures of just the bridal couple. In the church we managed to take all pictures traditiionally wanted, and thanks to the fact that my wife and I were seated on either side of the altar we could cover various angles, without having to run around disturbing the ceremony. What the clergyman and probably also the bridal couple do not want to see is a photographer creeping up behind the altar rails, indiscreetly trying to take wide-angle pictures. Yes, such things do happen. Of course there were lots of traditional pictures of the bridal couple. You had to work quickly, as the time schedule was one hour behind and the storm was approaching at an increasing speed. EOS-1 DX. EF 70–200 mm at 200 mm. Exposure: f/3,2. 1/4000 sec. ISO 2000. Exposure compensation minus in order not to burn out the light partier. What secrets are there behind the wooden door? Exposure: Bl. 4, 1/5000 s. ISO 2000. Aperture priority. There was very little time for pictures of the bridal couple down at Sillvik where we first went. But looking at the result afterwards the couple was surprised of how much we did get on those 20–25 effective minutes we had. First, we took pictures out on the cliffs, and then we got a series of pictures beside some trees and on a path that we made the bridal couple walk up along and then back. 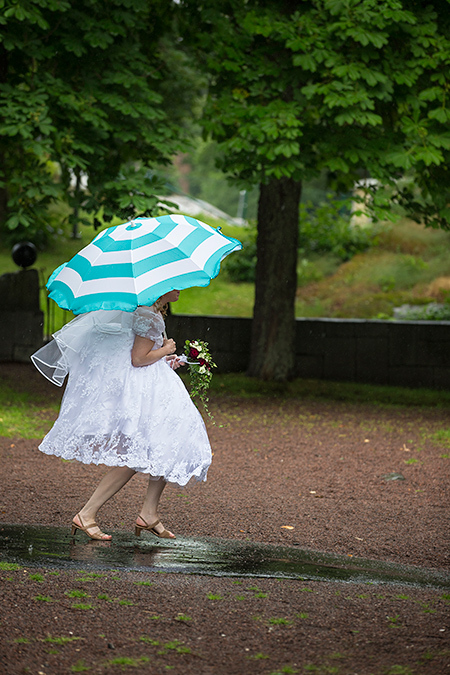 Here some of the last pictures, before the rain forced the bride to flee up to and into the bus shelter at the turning bus stop. Yes, there are some extra pictures of the dressed-up bride in the bus shelter as well. But these I save this time. Just as the pictures inside the church. Were we good enough as wedding photographers? Let's see. In any case, it was fun and I would like to do it again. And then once more together with my wife. It is a good thing to be two people, when it is about something as important as a wedding. 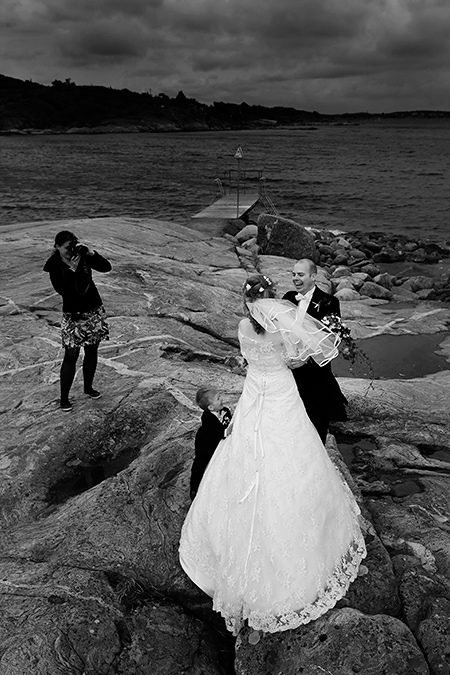 My wife Agneta (to the left) working with the couple down the stones by the Sea. We worked with different angles and I had just changed to a new memory card. 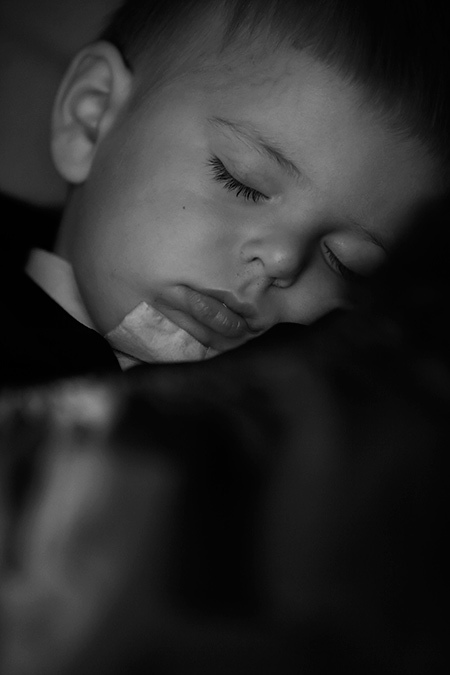 2-year old Erik fell asleep after the wedding ceremony in the church. Camera: EOS–1 DX. EF 70–200 mm f/2,8 L IS II USM at 200 mm. Exposure: f/3,2, 1/400 sec. ISO 400. Aperture priority. The stuff above I photographed in both B/W (JPEG) and colour (RAW). But my favourite picture this day was taken by my wife, Agneta Östling. There is something in the picture below that feels like Edvard Munch's The Scream. It will perhaps rather be a memorial picture from the shooting rather than a traditional wedding picture, but I immediately fell for the picture as soon as I saw the RAW file. 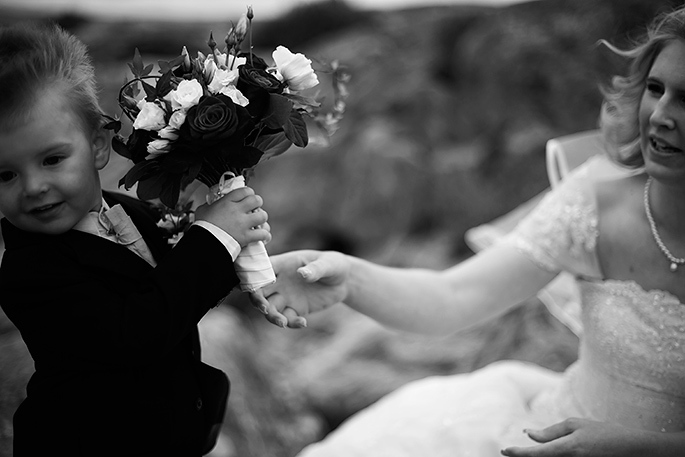 My favourite picture from the wedding was taken by my wife, Agneta Östling. 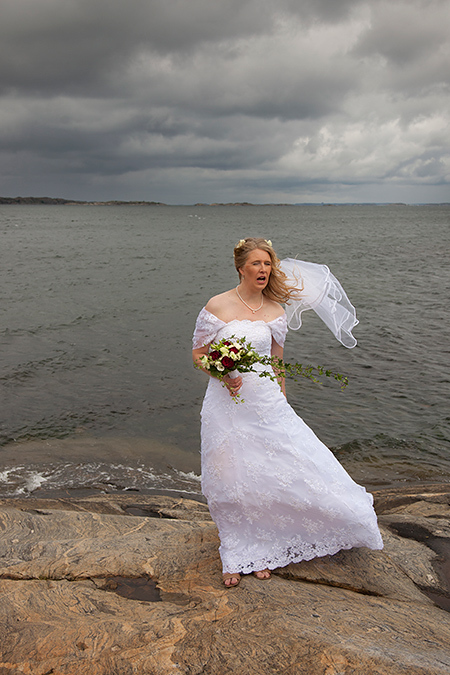 It portrays the bride in the approaching storm. Something in the picture feels like Edvard Munch's The Scream. I darkened the sky a little bit in Photoshop by using Multiply in Layers like in another picture above. 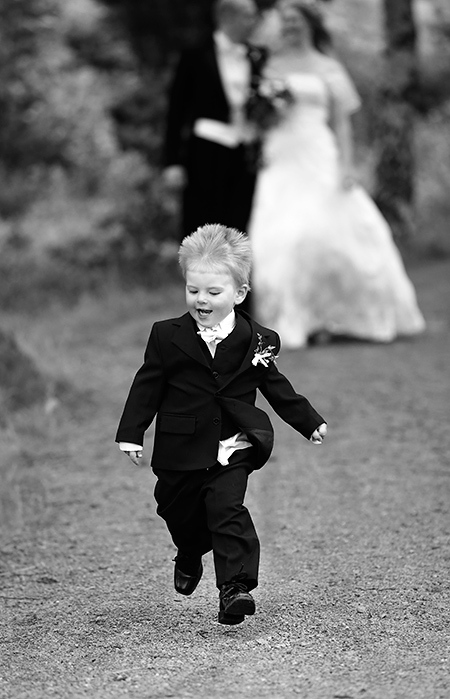 Finally: If you want to be able to use these wedding pictures in other contexts, e.g. 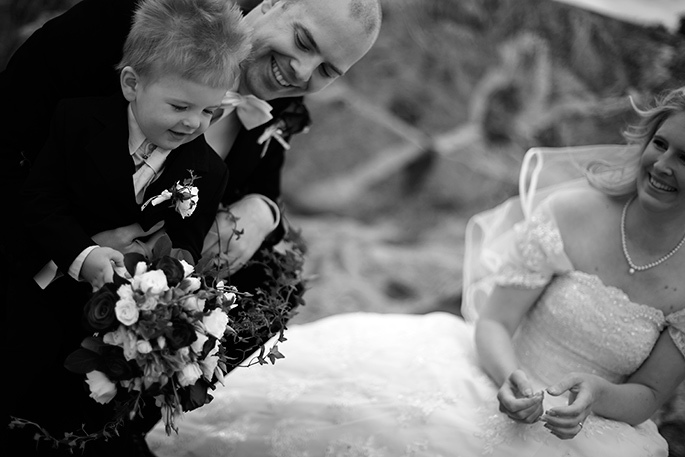 in a blog or in commercial advertising, you should come to an agreement in advance with the bridal couple. 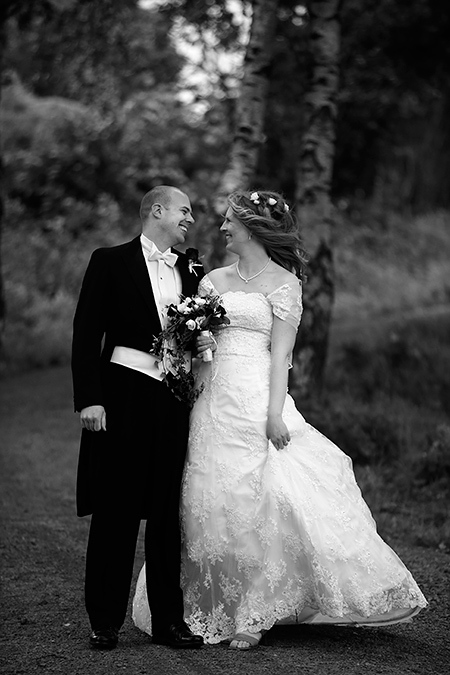 The photos here are published with the permission from the bride and the groom.